The theme for our monthly dinner party was "Comfort Foods." There were plenty of comforting dishes: Chicken and Noodles, Shepard's Pie, Mac and Cheese. What else do you need? Why delicious deserts, of course! There were chocolate chip cookies and chocolate cakes. My contribution was an Apple Pizza. Sort of like an Apple Pie turned into a pizza. 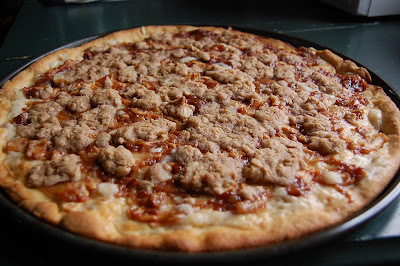 Sweet pizza/pastry crust and cream cheesy topping sprinkled with cinnamony caramelized apples and a streusel topping. Delicious! Peel and slice the apples. Melt butter in a skillet, add apples, sugar, flour and cinnamon. Simmer 15 minutes, then cool. Mix in a bowl and set aside. Blend 1 1/2 cup flour, yeast, sugar, and salt in a large mixer bowl. Heat water, milk, and butter until very warm; add to flour mixture and beat three minutes. By hand, stir in enough flour to make a soft dough. Cover and let rise 15 minutes. Pat dough onto a large oiled pizza pan, forming a rim around the edge. Spread on cheese topping, then apple topping over cheese; sprinkle with streusel topping. Cover and let rise for 15 minutes. Bake at 375 degrees for 25 to 30 minutes. Serve warm or cold. Serves 16. I've been wanting to make something like that lately... you've just inspired me to get to it!